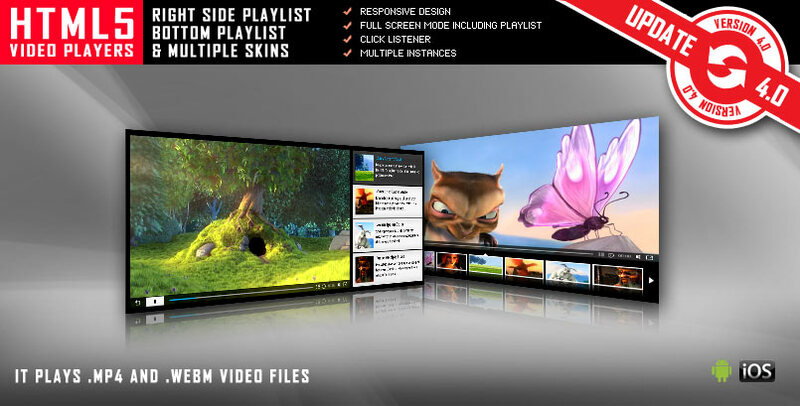 With HTML5 Playlist Video Player with Multiple Skins you have the option to select one of the 5 custom made skins which will enrich the design of your page. Very good in every aspect, from the product quality, easy to set up and excellent customer support. Great service, products and easy to fix step, I .highly recommend! This player looks good and works well, and I've purchased and used it twice. The documentation is helpful but you might need Chrome's Inspect feature to modify undocumented objects and styles. The tech support is reasonably prompt and correct. Responsive Design: HTML5 Playlist Video Player with Multiple Skins if fully responsive. Parameter to enable or disable responsive behavior. Fullscreen: HTML5 Playlist Video Player with Multiple Skins supports full screen, having all the controllers usable in full screen mode, including playlist.